Austin, Texas – May 12, 2017 – Transfinder Corp., the leading developer of school bus routing software, named Kecia Ling, director of transportation operations at Savannah-Chatham Public County School System, its Ambassador of the Year. Ling was named Ambassador of the Year during Transfinder’s three-day Annual Client Summit in Austin, Texas. The summit ends today. Ling becomes the third Ambassador of the Year, the first being named in 2015. Transfinder President and CEO Antonio Civitella said with more than 1,800 clients, it takes a special story to be considered for the Ambassador of the Year award. Ling said the district learned in February that it would not be turning to its third-party busing company for transportation in the fall. That left her with the need to build her team and learn Transfinder, a software system different from what the previous vendor had used. Ling said her team worked 13-hour days for two months straight to be ready for summer school and the fall opening. School had closed for more than a week, and when it reopened, Ling and her team used Transfinder software to create new routes for students scattered in different locations from where they were when the school year started. 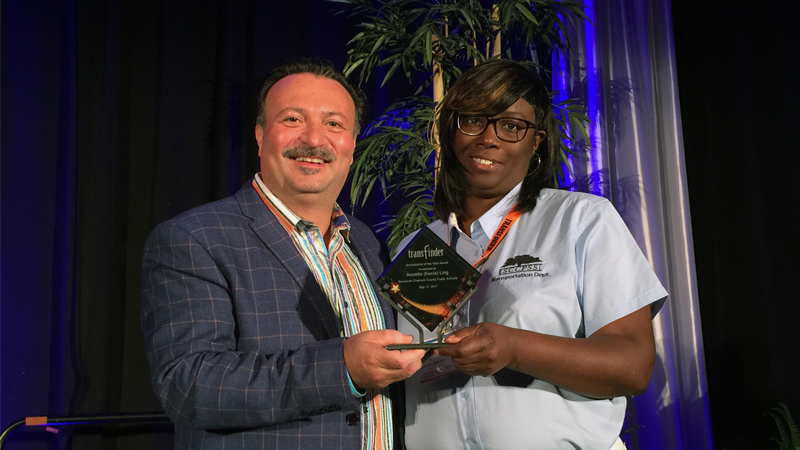 The award was given before more than 250 school transportation officials from 36 states and two Canadian provinces who attended the three-day conference. Earlier in the day, summit’s keynote speaker Ms. Donna Bohorich, chairwoman of the Texas State Board of Education, spoke on leadership. Founded in 1988 and headquartered in Schenectady, New York, Transfinder is a national leader in intelligent transportation systems, providing transportation management systems and services to school districts, municipalities and adult care facilities. Transfinder, an Inc. magazine “fastest-growing company” for the past ten straight years, has offices in Austin, Texas, and Shanghai, China. The software company develops and supports routing and scheduling solutions for optimal transportation logistics.